Selecting Removable Doors from the Access Panes collection for your access needs comes bundled with numerous seamless advantages. 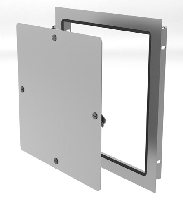 These doors are available in many shapes, sizes, and lock configurations. In addition, each lock from this collection comes with state of the art weather-stripping for precision climate control. In fact, these removable doors open broad array of options for defining the climatic variables as per your requirements. Unlimited customization is possible; all you need is a few mouse clicks. Explore the world of access panels to define every essential element of access control, safety, and security. Well, it indeed is your one-stop shop for all access needs. Elmdor WSR10x10 Weather Strip, Removable Access Doors WSR Series 10"x 10"
Elmdor WSR12x12 Weather Strip, Removable Access Doors WSR Series 12"x 12"
Elmdor WSR14x14 Weather Strip, Removable Access Doors WSR Series 14"x 14"
Elmdor WSR16x16 Weather Strip, Removable Access Doors WSR Series 16"x 16"
Elmdor WSR18x18 Weather Strip, Removable Access Doors WSR Series 18"x 18"
Elmdor WSR24x24 Weather Strip, Removable Access Doors WSR Series 24"x 24"
Elmdor WSR8x8 Weather Strip, Removable Access Doors WSR Series 8" x 8"